Established in 1853, The Royal Jumbo Group is one of the oldest toy companies in Europe selling games, puzzles and toys, and has been a leading manufacturer in the UK since 1996. Jumbo boast an impressive and diverse range of children’s jigsaw puzzles and games, holding a successful portfolio of licenses such as Peppa Pig, Something Special, Fireman Sam, Ben & Holly’s Little Kingdom, Strange Hill High and Q Pootle 5. 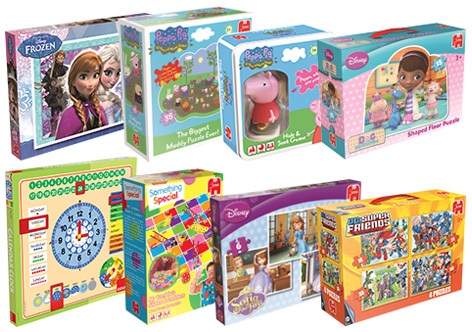 As well as the Disney phenomenon – Frozen, they also have a fantastic range of the ever-popular Disney Doc McStuffins, Disney Sofia the First, Disney Henry Hugglemonster, Disney Minnie Mouse, Disney Mickey Mouse Clubhouse, Disney Princess, Disney Jake and The Never Land Pirates and Disney Planes and Cars. There is also a range specially designed to help young children develop whilst having fun with puzzles & games - Jumbo Playlab. Jumbo also produce a range games for the above licenses and have won numerous awards for them. New to Jumbo’s children offering if their stunning range of high quality and robust wooden Goula puzzles and games. There are over 40 products in the Goula range that offer everything from basic wooden peg puzzles, wooden texture puzzles, interchangeable puzzles, memo and lotto games to a multifunctional educational wooden clock that helps children learn to tell the time, day, week, month and season. 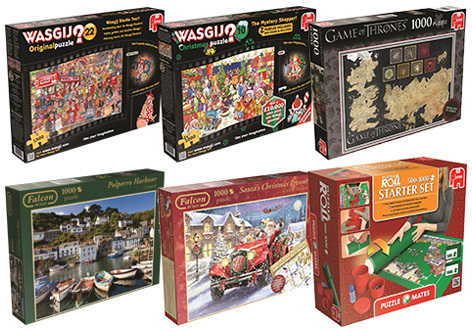 Jumbo is the leading manufacturer of adult puzzles and puzzle accessories in the UK with portfolio of strong brands and licenses such as Wasgij, Game of Thrones, Falcon de luxe, Jan van Haasteren, Puzzle Mates and more. Using a high quality cardboard and precision cutting technique at their own factory, all the finished puzzles have a seamless poster-like finish to give puzzlers the best possible experience and hours of enjoyment with all of their jigsaw puzzles. Wasgij is the UK’s No. 1* adult jigsaw puzzle and been a puzzlers favourite since 1997. Wasgij is the unique ‘brainteaser’ puzzle concept that is unlike traditional jigsaws – instead you have to use your imagination and the clues provided to piece together a different image depending on the concept. There are over 60 highly detailed and extremely humorous jigsaw puzzles in the range across four key concepts; Original, Destiny, Mystery and What If…?